Fast urbanization and overcrowding in cities steers life towards multi-storey buildings and high rises. The degree of capability to manage indoor transportation is strongly correlated with the quality of public life. 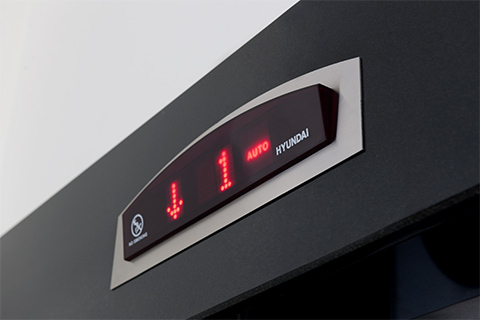 As Hyundai Elevator, we guarantee smooth circulation inside buildings with our smart technologies. Our specially developed Elevator Tracking System allows us to provide real quick solutions to stressful situations. We respond to circulation problems almost instantly, without having our customers to call and inform us. How does the Elevator Tracking System work? System allows the clients to track their elevators remotely. In case of malfunction, it informs building security instantly. The system logs information and allows building authorities to monitor detailed data like the exact time, floor, duration and date of the malfunction any time. If the passengers are stuck in the elevator, the system instantly informs our Call Center. Our technical team immediately departs to intervene. Loss of time due to ill efforts to explain the problem or long waiting periods for service are eliminated.